Less than one week after Jennicet Gutierrez courageously interrupted the White House Pride reception to demand that President Obama end the detention and abuse of transgender immigrant women, the administration made public a new memo on the topic. White House Asked: Is the President Aware of the Issue of Trans Detention? The day after Jennicet Gutierrez of FAMILIA TQLM interrupted the President at the White House Pride Celebration, Press Secretary Josh Earnest is asked if the President would respond the same way were it to happen again. After a non-answer, he’s asked if the President is even aware of the issues being raised by Jennicet. There is no Pride as long as LGBTQ Immigrants are being imprisoned, she says. WASHINGTON, DC — Just moments ago, Jennicet Gutiérrez interrupted the President during the White House pride celebration shouting “President Obama, release all LGBTQ immigrants from detention and stop all deportations.” As a transgender woman who is undocumented, Gutiérrez said she could not celebrate while some 75 transgender detainees were still being exposed to assault and abuse in ICE custody at this very moment. The blog post below is by Jorge Gutierrez, National Coordinator of FAMILIA TQLM. Yesterday Hillary Clinton spoke about immigration during a roundtable with young people in Nevada. It is no coincidence or surprise that the topic of immigration is at the forefront of her presidential campaign given the organizing power many grassroots immigrant rights organizations have been building for the last several years. We know that while the courts deal with the injunction of DAPA and extended DACA, our undocumented immigrant communities continue to be detained and deported. Private corporations continue to build detention centers, fill 34,000 beds with our people every year, and profit at the cost of the suffering of our undocumented community. 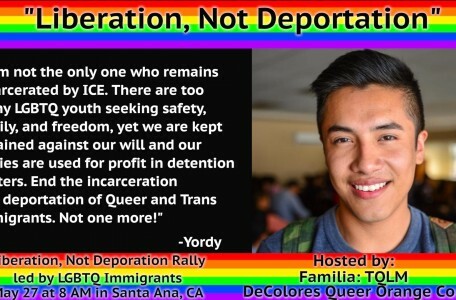 We also know that LGBTQ undocumented immigrants, especially transgender women, continue to be detained, tortured and deported by Immigration Customs Enforcement (ICE). Take the case of Nicoll Hernandez-Polanco, a 24 year old transgender undocumented woman, from Guatemala that spent 6 months in a detention center in Florence, Arizona. Nicoll was placed in all male facility; her gender identity was not respected and she experienced sexual and physical abuse. She was recently released after months of a public campaign. And her case is only one of many transgender undocumented women in detention centers who continue to experience abuse and torture.